NASA has begun to define the approach towards capturing a space rock that will be investigated during the Exploration Mission -2 (EM-2). 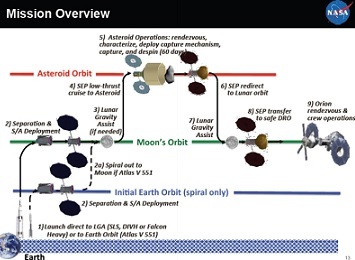 The Asteroid Redirect Robotic Mission (ARRM) will involve a robotic spacecraft sent out to hunt and capture the small asteroid, ahead of being towed to a Lunar Orbit for astronauts to investigate during the first crewed Orion mission. NASA has made the Asteroid Redirect Robotic Mission (ARRM) a high priority since it was first proposed in early 2013. A NASA internal study was kicked off in July 2013 to determine the feasibility of the ARRM. A Broad Agency Announcement (BAA) was released on March 21, 2014 to study the potential mission and the associated costs with awards to be announced no earlier than July 1. On March 26, NASA held an Asteroid Initiative Opportunities Forum to discuss the current state of the mission as envisioned by the internal NASA study group. As currently envisioned, the ARRM mission consists of either the capture a small asteroid <10m in diameter and a mass of <1000 tonnes or the sampling of a boulder from the surface of a larger asteroid. The asteroid capture mission was the initially proposed by the Keck Institute and was the mode initially proposed by NASA. The initial proposed spacecraft has been refined to a somewhat smaller vehicle than originally projected. The current representative vehicle uses a 50kW solar electric array to power an array of Hall thrusters with at least 10 tonnes of Xe on board. It will be built with docking features compatible to Orion and external features needed to enable astronauts to traverse the exterior of the vehicle and access the captured asteroid. The spacecraft is also to be designed with possible future use in mind, so that the basic vehicle can be used as the basis for cargo delivery to support a future notional Phobos mission. After the initial analysis of the potential mission candidates was undertaken by the internal study group, it was determined that the timing of any human mission coincident with the current EM-2 time frame was not feasible, therefore missions were evaluated with the intent of locating the captured asteroid in a Deep Retrograde Lunar Orbit (DRO) to support a human mission in the mid-2020 assuming a mid 2019 launch date for the spacecraft. The current known NEO population was evaluated and newly discovered asteroids added to that analysis as they were characterized. The current leading candidates for the ARRM mission were narrowed to five potential candidates. Two candidate asteroids, 2009 BD and 2011 MD, were sufficiently promising that high fidelity trajectory analysis of the mission have been completed. 2009 BD is a valid mission candidate with the mass of the asteroid (30-145 tonnes) falling well within the spacecraft capabilities and with a relatively slow rotational period (>2 hrs). Optical characterization of 2011 has been completed, but the analysis of the data is still underway. It appears that the asteroid will fall within the mission constraints. Of note, four different launchers have been evaluated for use in this mission scenario, the Atlas V 551, Delta IV Heavy, Falcon Heavy and SLS. 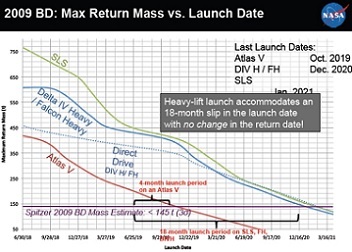 For the notional launch date of mid 2019, the use of heavy class launchers – Delta IV Heavy, Falcon Heavy and SLS – does not significantly increase the returned mass, but they do allow for a significant delay in launch date and still return the asteroid in time for a manned mission in the 2024 time frame given the upper limit mass of 2009 BD. One of the most criticized portions of the proposed mission was the concept to “despin” the asteroid after capture by a bag system. Careful analysis of the forces and fuel requirements to despin a representative 1000 tonne asteroid spinning in an arbitrary manner was undertaken to determine if this was a possible using current spacecraft construction methods. It was determined that the solar panel torque limits were the primary driver, but that current construction would be sufficient up to a spin rate of about 2rpm (at a 95 percent confidence level). 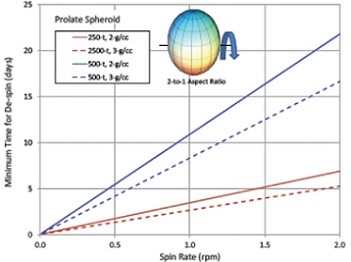 Analysis suggested that it would be possible to despin a 500 tonne asteroid with a rotational rate of 1 rpm to 0 rpm in less than 6 days using < 12 kg of Xe and <70 kg of hydrazine. 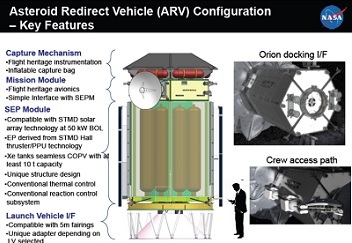 Significantly, a planetary defense demo has been proposed for each of the mission concepts to prove out gravity tractor and/or ion beam deflection (IBD) concepts. For an object similar to 2009 BD (<500 tonne), a Δv of ~ 1mm/sec could be imparted in roughly 1 hr using IBD and about 30 hrs using gravity tractor. It was determined that neither of these demonstration would have a significant impact to the overall capture mission. 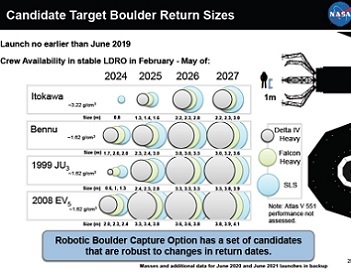 The boulder sampling mission was proposed as an alternate way to meet the asteroid return goal originally envisioned. This entails either hovering over, or making a soft touchdown on, the surface of the asteroid followed by the sampling of a boulder of up to 5m diameter. Four asteroids have been evaluated as candidate donors for the boulder capture missions. Itokawa, the asteroid visited by the Japanese probe Hayabusa, is the most promising candidate with the boulder population already well characterized by its previous visit. Due to its favorable orbit parameters, 2008 EV5 offers the possibility of returning the largest specimen of the evaluated asteroids, up to 4 m in diameter (roughly 50 tonnes) using SLS as the launcher – slightly smaller values for Delta IV Heavy and Falcon Heavy). Analysis of the boulder capture mission suggests that removal of any entrained boulder should be relatively easy as the cohesive forces in the regolith surface are expected to be low. A planetary defense demonstration is also planned for the boulder collection mission. Due to the larger nature of the parent body, the demonstrations will take significantly longer than the asteroid capture mission. 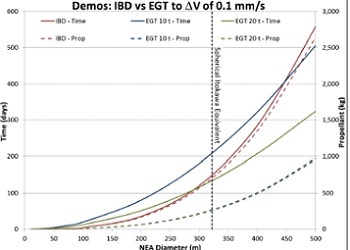 For Itokawa, it is anticipated that a Δv of 0.1mm/sec can be imparted in 150 – 200 days for the gravity tractor or IBD scenarios. Based on the anticipated difficulty of the proximity operations, the gravity tractor demo will probably be selected. Gravity tractor also is more fuel efficient; requiring about 300 kg of propellant versus 600 kg for IBD. Despite criticism of the concept of send a manned mission to sample the asteroid, NASA is aggressively pursuing to ARRM concept and has demonstrated that there are no technological roadblocks to implementation. In fact the mission as current envisioned is more feasible than the original Keck Institute study suggests as the mission uncertainties have been evaluated and defined.